The Telecom Regulatory Authority of India (Trai) has come up with a new portal, allowing consumers to compare all the available tariff plans of telecom operators in the country. For quite some time, the regulator was looking to bring transparency in tariff plans and this move is the first such platform; This platform is backed by the government as well. The new portal, for now, is in beta stage and displays all the regular tariffs, STVs (special tariff vouchers), promotional tariffs and value-added service plans. Besides the mentioned plans, all other plans of telcos will also be visible on the website, so that the user can head over to the portal and compare the plans for themselves. At the moment, Trai will be collecting extensive feedback from the public, and in the future, the regulator will add all the circle plans in the portal, but it’s going to take a while. “As per Trai act 1997, transparency is an important mandate of Trai. Presently, telecom service providers offer tariffs at their websites,” Trai said in a press statement. The link to the website is tariff.trai.gov.in, which as stated is live for the public. 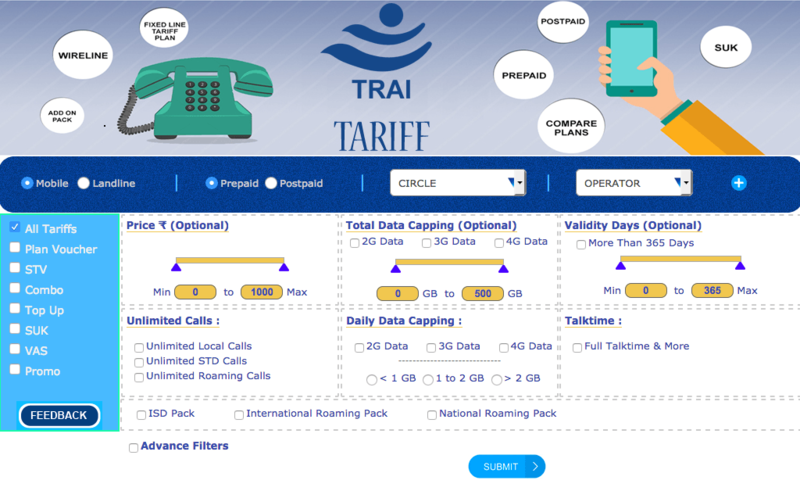 “For easy access, various tariff plans and other tariff instruments are provided at Trai website in downloadable format. This platform would not only benefit the consumers but also help other stakeholders to do a comparative analysis,” it added. “There are many tariffs that carriers offer but consumers are not able to see everything at one place, and there’s no method to compare tariffs. So, we have done this primarily for consumers, starting with Delhi. We want to see what more can be done on the site which is why consumer feedback has been sought,” said Trai secretary Sunil Gupta during the launch of this portal. Furthermore, this portal will make it easier for recharge portals such as Paytm, Mobikwik etc, given the fact that they can download the data and use it on their portals. Right now, the tariff plans segment in India is very difficult to understand. Major telecom players such as Airtel, Idea Cellular and Vodafone India are launching segmented tariff plans, which is becoming extremely tough for users to find out the best plan. Reliance Jio, on the other hand, makes the job easier by offering pan-India tariff plans. Expecting that details of other circles will be added soon.